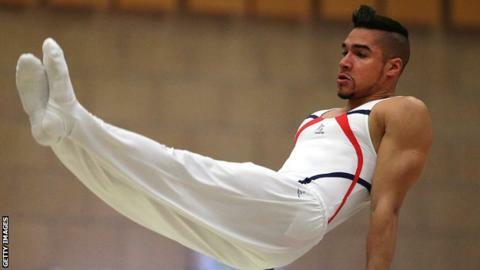 British Gymnastics men's head coach Eddie van Hoof has defended the decision to not pick Louis Smith for this month's European Championships. Smith, 25, who won an individual silver medal at the 2012 Olympics, returned to gymnastics earlier this year but has been left out of the British squad. He tweeted: "If only it was because I wasn't good enough #politics. Now I remember why I needed a break." Van Hoof said: "It's not a political decision. It's purely on performances." Smith took a break from gymnastics after winning team bronze and pommel horse silver at the London 2012 Olympics to add to the pommel horse bronze medal he won at the Beijing Games of 2008. He returned to training in January in a bid to compete at the Commonwealth Games, which will be held in Glasgow from 23 July to 3 August. Smith has since finished second in the pommel horse at the English Championships and third in the same discipline at the British Championships in March. He admitted he was disappointed to be left out of the British squad for the European Men's Artistic Gymnastics Championships, which will be held in Sofia, Bulgaria from 19-25 May. "I was in every European team since 2004, every world team and every Olympic team," added Smith. "The only thing that's changed now is I'm not funded." Van Hoof, who is involved in the Team England selection process for the Commonwealth Games, said while Smith's performances since returning have been impressive, his role as a pommel horse specialist and the development of other gymnasts had worked against him. "He's on top form and competed in the English Championships and British Championships and did remarkably well," Van Hoof told BBC Sport. "Carrying one person in just one apparatus is pretty difficult because it destabilizes the balance across the team." "Three of the team going to Bulgaria are Scottish, so there's some flexibility," added Van Hoof, who said Smith's hopes of competing in the Commonwealth Games were "certainly not dead yet." Max Whitlock, Dan Keatings, Dan Purvis, Sam Oldham and Kristian Thomas will represent Great Britain in Bulgaria, with Frank Baines in reserve, where they will be defending the European team gold medal Britain won in 2012.